It was another glorious day in Cápri on Tuesday morning but after a leisurely morning we set sail around 1100 – there’s a theme starting to form I think – and made our way to Amalfi. We found a bit of wind for a couple of hours and then, as predicted, it died so we motored the rest of the way. 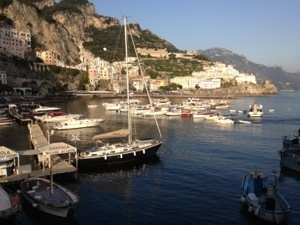 We arrived in Amalfi around 1600 to find a cruise liner and the tall ship from Capri. A young guy in a rib came out to greet us and quoted us €50 for the night. This is not a bad price for around here so we agreed. Jo had hurt her back again a couple of days before and the long walk on Cápri seemed to have exacerbated it so it was now agony. Consequently, after a short walk into town, she retired back to the boat and missed the rest of the evening. 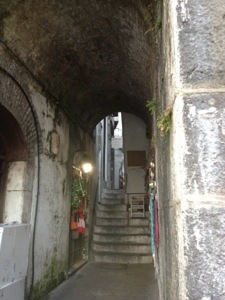 The town is lovely but not as smart as Cápri but very picturesque. The marina is tiny though so you can see how it would be very crowded in summer. The others went for yet another lovely meal in town. 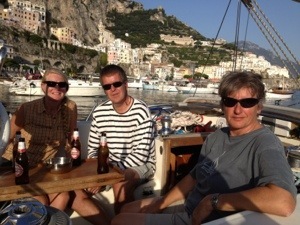 The following morning, Jo’s birthday, was another glorious day and after a birthday breakfast in a local restaurant we set sail for Sorrento. However, as there was no wind again, we motored the whole way apart from a 10 minute spell when we thought we might get a bit of afternoon breeze. 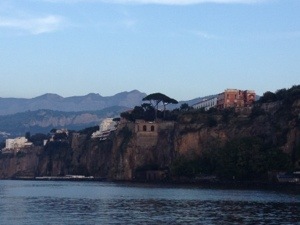 So we took our time and motored down the famous Amalfi coast with its cliff top houses and sheer sides. 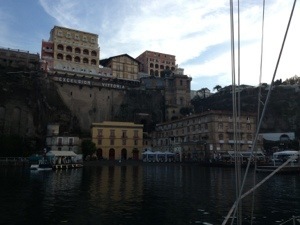 Arriving in Sorrento we weren’t sure about the depths as the pilot book talks of anything between 1 and 3 metres. However, a new breakwater has been built as well as a new visitors’ pontoon that can take superyachts so we figured that we were ok! It’s also a ferry port inside the harbour and they seemed to be disgorging passengers every ten minutes – extraordinary given that it is late October. Off this evening for a meal in town but not before a celebratory glass or two of bubbly! 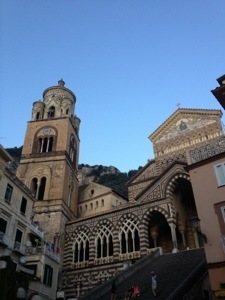 Pictures below of us and Nimmie in Amalfi, Amalfi town and the last two are of Sorrento. Happy Birthday for yesterday Jo – hope your back is feeling a bit better. Did you know you share a birthday with Nigel and I? Obviously a very cool day to have a birthday ! !